Optional quick roll change axle, the WR FT “tool-less” axle, requires no tools and saves time. Below, you will find a brief description for groups or single models of straightening rolls and wire guides or guide rolls, and some of their applications. Please, if you need assistance choosing the right straightening roll or wire guide roll, please give us a call at 1-410-228-8383 or contact us here. WN / WK Straightening Rolls: All have high load needle bearings with standard “V” groove. Custom sizes and groove profiles available. If you will tell us the size and type of material you are handling, we will suggest a “custom-fit” straightening roll. 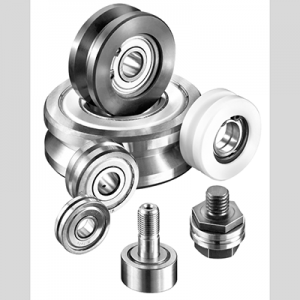 PA, PB, PC Guide Rolls: Heavy-duty, ball bearing based rolls suitable for high speed applications. Wide variety of material choices include PETP and Polyurethane plastics for handling delicate products. FA, FB, FC Guide Rolls: Heavy-duty, ball bearing based guide rolls are well suited for high speed applications. Available in a variety of materials, including corrosion resistant materials for use in high humidity areas. WR HL rolls for heavy loads. SEE MORE IN OUR CATALOG.